Banzai Racing has designed custom 13B-RE / 20B engine brackets to allow installation of both engines into the 2nd Gen RX-7 chassis. This set of brackets works for both engines. Our brackets are fabricated from laser cut & CNC punched 11GA Steel. They are then press brake formed and TIG welded. 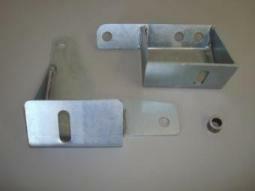 Brackets are finished with a Bright Zinc plating to prevent corrosion. The kit comes complete with the spacer required for immediate installation. Fitment is guaranteed. Click Here to see our Banzai Racing Project '91 S5 Vert 13B-RE Cosmo Conversion using these brackets. As a result of hearing many complaints from customers about stock motor mounts and seeing first-hand how frequently they break, we decided to develop these much more durable and adjustable mounts. 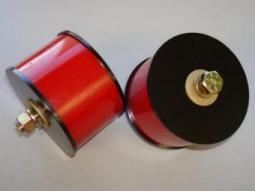 They are manufactured from 90A durometer red polyurethane, with 3mm E-Coated steel end-caps. All hardware included in kit is grade-8. These mounts should never need replacing. 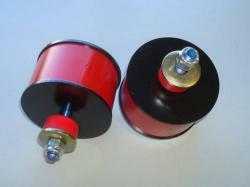 These motor mounts will drastically reduce engine movement, making for quicker shifting and faster ETs. They cause slightly more vibration than stock, but significantly less than solid mounts. Adjustability is designed in, allowing you to stiffen or soften the mounts to your requirements. Our Street Version Poly mounts have been designed to virtually eliminate any vibration transfer. The internal locknut has been eliminated and an additional poly isolator is added under the subframe.